Meningitis is usually the result of a viral or bacterial infection. Viral meningitis, also called aseptic meningitis, is generally less severe and often disappears without specific treatment, while bacterial meningitis can be quite serious and may result in brain damage, hearing loss, or learning disabilities in children. The infection may even cause death. Bacterial meningitis is either monococcal or pneumococcal, depending on the type of bacteria responsible for the infection. Meningitis caused by Haemophilus influenzae and related strains (A, B C, Y, and W135) is also called meningococcal meningitis. Similarly, meningitis due to Streptococcus pneumoniae is also called pneumococcal meningitis. Most types of meningitis are contagious. A person may be exposed to meningitis bacteria when someone with meningitis coughs or sneezes. The bacteria can also spread through kissing or sharing eating utensils or a toothbrush. According to the National Institute of Neurological Disorders and Stroke (NINDS), some 6,000 cases of pneumococcal meningitis are reported in the United States each year. Meningococcal meningitis is common in minors ages two to 18. Each year about 2,600 people get this highly contagious disease. High-risk groups include infants under the age of one year, people with suppressed immune systems, travelers to foreign countries where the disease is endemic, and college students and Army recruits who reside in dormitories and other close quarters. Between 10 and 15 percent of cases are fatal, with another 10 to 15 percent involving brain damage and other serious side effects. 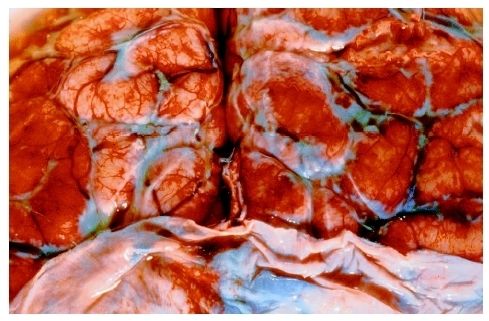 Brain tissue infected with acute meningitis. The bacteria which cause bacterial meningitis live in the back of the nose and throat region and are carried by 10 to 25 percent of the population. They cause meningitis when they get into the bloodstream and travel to the meninges. At least 50 kinds of bacteria can cause bacterial meningitis. According to the Centers for Disease Control (CDC), before the 1990s, Haemophilus influenzae type b (Hib) was the leading cause of bacterial meningitis, but subsequent vaccines given to all children as part of their routine immunizations have reduced the occurrence of the disease due to H. influenzae . As of 2004, Streptococcus pneumoniae and Neisseria meningitidis were the leading causes of bacterial meningitis. In newborns, the most common agents of meningitis are those that are contracted from the newborn's mother, including Group B streptococci (becoming an increasingly common infecting organism in the newborn period), Escherichia coli , and Listeria monocytogenes . The highest incidence of meningitis occurs in babies less than a month old, with an increased risk of meningitis continuing through about two years of age. Older children are more frequently infected by the bacteria Haemophilus influenzae , Neisseria meningitidis , and Streptococci pneumoniae . Most cases of viral meningitis are caused by enteroviruses (viruses that typically cause stomach flu). However, many other types of viruses, such as the herpes simplex virus, the mumps and measles viruses (against which most children are protected due to mass immunization programs), the virus that causes chickenpox , the rabies virus, and a number of viruses that are acquired through the bites of infected mosquitoes. Meningitis symptoms include high fever , headache , and stiff neck in children over the age of two years. These symptoms can develop over several hours, or they may take one to two days. Other symptoms may include nausea , vomiting , discomfort looking into bright lights, confusion, and sleepiness. In some cases, a rash may be present. In newborns and small infants, these symptoms may be absent or difficult to detect, and the infant may only appear slow or inactive, or be irritable, have vomiting, or be feeding poorly. As the disease progresses, patients of any age may also have seizures. Parents should call a doctor if a child has a temperature above 101°F (38.5°C). If any meningitis symptoms occur, the child should see a doctor immediately, as early diagnosis and treatment are very important for a successful outcome. Viral meningitis often remains undiagnosed because its symptoms are similar to those of the common flu. As for bacterial meningitis, the diagnosis is established by growing bacteria from a sample of spinal fluid. The spinal fluid is obtained by performing a lumbar puncture (also called a spinal tap), in which a needle is inserted into an area in the lower back where fluid in the spinal canal is readily accessible. Bacterial meningitis treatment usually involves intravenous administered antibiotics , for a minimum of four days. The type of meningitis contracted will determine the specific antibiotic used. It is imperative that treatment start as early as possible, in order to avoid brain damage and death. Viral meningitis cases usually resolve without complications, but typically, antibiotics are ineffective in treating it, so none are prescribed. The child will be told to get as much rest as he or she can. If the child has pain related to the disease such as headaches or other body pains, medication can be used to treat it. The long-term outlook for children who develop bacterial meningitis varies significantly. The outcome depends on the child's age, the bacteria causing the infection, complications, and the treatment the child receives. The complications of bacterial meningitis can be severe and include neurological problems such as hearing loss, visual impairment, seizures, and learning disabilities. The heart, kidneys, and adrenal glands may also be affected. Although some children develop long-lasting problems, most children who receive prompt diagnosis and treatment recover fully. Many children as of 2004 routinely receive vaccines against meningitis, starting at about two months of age. Immunizations are recommended by the American Academy of Pediatrics and many other organizations. If a child has not been vaccinated, parents should talk to their doctor about the Hib and pneumococcal (Prevnar 7) vaccines. Bacterial meningitis —Meningitis caused by bacteria. Depending on the type of bacteria responsible for the infection, bacterial meningitis is either classified as monococcal or pneumococcal. Viral meningitis —Meningitis caused by a virus. Also called aseptic meningitis. Vaccines are available for both meningococcal and pneumococcal meningitis. Specifically, there are vaccines against Hib and against some strains of N. meningitidis and many types of Streptococcus pneumoniae . The vaccines against Hib are very safe and highly effective. There is a vaccine that protects against four strains of N. meningitidis , but it is not routinely used in the United States. There are also vaccines to prevent meningitis due to S. pneumoniae , which can also prevent other forms of infection due to S. pneumoniae . Parents should teach children to wash their hands often, especially before they eat and after using the bathroom, or after petting animals. They should be taught how to wash their hands vigorously, covering both the front and back of each hand with soap and rinsing thoroughly under running water. Some forms of bacterial meningitis are contagious. The bacteria are spread through coughing, kissing, and sneezing. Fortunately, the bacteria that cause meningitis are not as contagious as the common cold or the flu, and they are not spread by casual contact or by simply breathing the air where a person with meningitis has been. However, people in the same household or daycare center, or anyone with direct contact with a patient's oral secretions is considered at increased risk of acquiring the infection. Awareness of the symptoms and signs of meningitis, especially the rash which may accompany meningococcal meningitis is very important. Leigh, Jenny. A Dr. Spot Casebook: George Has Meningitis. London: Haldane & Mason, 2003. Routh, Kristina. Meningitis (Just the Facts). Chicago: Heineman Library, 2004. Tunkel, Allan R. Bacterial Meningitis. Philadelphia: Lippincott Williams & Wilkins, 2001. Anderson, V., et al. "Cognitive and executive function 12 years after childhood bacterial meningitis: effect of acute neurologic complications and age of onset." Journal of Pediatrics & Psychology 29, no. 2 (March 2004): 67–81. Gupta, S., and A. B. Tuladhar. "Does early administration of dexamethasone improve neurological outcome in children with meningococcal meningitis?" Archives of Disease in Childhood 89, no. 1 (January 2004): 82–83. Hvidd, A., and M. Melhye. "Impact of routine vaccination with a conjugate Haemophilus influenzae type b vaccine." Vaccine 22, no. 3–4 (January 2004): 378–82. Posfay-Barbe, K. M., and E. R. Wald. "Pneumococcal vaccines: do they prevent infection and how?" Current Opinions in Infectious Diseases 17, no. 3 (June 2004): 177–84. Spach, D. H. "New issues in bacterial meningitis in adults. Antibiotic resistance has complicated treatment." Postgraduate Medicine 114, no. 5 (November 2004): 43–50. Meningitis Foundation of America. 6610 North Shadeland Avenue, Suite 200, Indianapolis, IN 46220–4393. Web site: http://www.musa.org. National Institute of Allergy and Infectious Diseases (NIAID). National Institutes of Health, 6610 Rockledge Drive, MSC 6612, Bethesda, MD 20892–6612. Web site: http://www.meningitis.org. National Meningitis Foundation. 22910 Chestnut Road, Lexington Park, MD 20653. Web site: http://www.nmaus.org. Meningitis Research Foundation. Midland Way, Thornbury, Bristol BS35 2BS, UK. Web site: http://www.meningitis.org. "Meningococcal Disease Homepage." Centers for Disease Control and Prevention. Available online at http://www.cdc.gov/ncidod/dbmd/diseaseinfo/meningococcal_g.htm (accessed October 25, 2004).